Tokyo Otaku Mode Inc. (Incorporated in Delaware; President & CEO: Tomohide Kamei; hereby referred to as TOM), a company whose main goal is to share Japanese pop culture with a global audience through their page Tokyo Otaku Mode, has collaborated with character from popular manga “Yotsuba&!”, Danboard, to produce the “Danboard Computer Glasses”. The glasses are designed with motifs based off of the character, and will be available for purchase with limited quantities. Pre-orders have started on TOM Premium Shop, the e-commerce shop run by TOM. 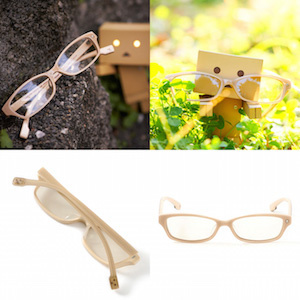 The “Danboard Computer Glasses” are computer glasses modeled after the popular character from Yotsuba&!, Danboard, and produced by TOM. The frames and lenses of all glasses are made by master artisans in Sabae, Japan, famous for being one of the three biggest glasses manufacturing areas in the world. The lens used are high performance, medical grade CR-39 lenses so that wearers will be reassured of their abilities to protect the eyes from harmful blue light. Not just a must have for Yotsuba&! fans, these glasses also provide comfort and protection for those who are frequently in front of their computers, smartphones, or game often. 1. Fun yet stylish design. A practical product perfect for fans. The color of the frames is themed after that of a cardboard box, the material Danboard is made of, and comes in a relaxed beige. Differing shades are also used on the exterior and interior, giving a unique look from every angle. The temple tips feature Danboard’s face. The coin slot on Danboard’s chest is also expressed on the front of the frames, making them both stylish and a bit playful. The case is also designed with a cute craft style and features Danboard’s face. Of course, the glasses cloth do as well. 2. Made in Japan Using High Quality Components. The frames and lenses of all the glasses use raw material from Italian company MAZZUCCHELLI and assembled by master artisans in Sabae, Japan, famous for being one of the three biggest glasses manufacturing areas in the world. The glasses use high performance, medical grade CR-39 lenses, delivering Made in Japan quality to fans all over the world. A manga created by Kiyohiko Azuma, serialized in Monthly Comic Dengeki Daioh from March 2003.The story revolves around the daily lives of a quirky girl named “Yotsuba”, her dad, and the people around them. Volume 13, the much awaited latest installment of the manga releases November 27 2015, two years after the previous volume. In total the series has sold over 13 million copies. The work won the first place award for the manga category in the 2006 10th Japan Media Arts Festival, and has been translated into 13 different languages with over 1 million copies sold in 23 different countries. Computer Glasses use special lens that help the wearer block out harmful blue light that comes from looking at LCD screens for too long whether on computer, TV, smartphones, and other electronics. By cutting blue light, your eyes are less tired and eye-strain is dramatically reduced, though the effect may vary by individuals. TOM developed these glasses to be a way for lovers of anime and games to more safely enjoy them by being protected by harmful blue light. This way, all fans can enjoy their favorite anime or games for many, many years to come. The frame and lens are made in Japan, and each authentic pair of TOM original computer glasses will have “Made IN SABAE JAPAN” marked on the inside of the frame. Even though the lenses cute out a high rate of blue light, the color of the lenses are kept as close to clear while still retaining its effect so that they are still practical yet fashionable for wearers while on their computer, watching tv, or using their smartphones. There are many more design collaborations with other franchises planned so please look forward to them. *Researched by Social Bakers (http://www.socialbakers.com/) (as of October 2015) Facebook is a trademark or registered trademark of Facebook, Inc. All other brand names, product names, or trademarks mentioned herein are registered trademarks of their respective companies and belong to their respective holders.